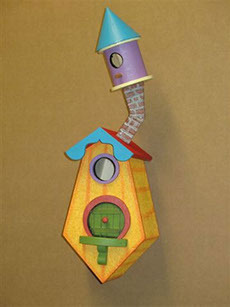 This brightly colored house comes adorned with a small chimney with a smaller decorative house on top. (The chimney house is designed for decoration only) This house is designed to be mounted on a pole or attached to a tree. This house will add that needed color to spark any budding garden or yard. Door does not open. Access for cleaning by loosening screw on back to release bottom panel. Each house has been treated with a water protective coating. It is recommended that if these houses are to remain outside in inclement weather that they be resealed every (6) months. This will keep them fresh and bright, and will help slow the deterioration. We use a Thompson’s water sealer, and an inexpensive pump sprayer, like one you use to water indoor plants. We custom-design and build fairy houses, fairy doors, and other items for a wide variety of clients, from large theme parks, other corporate displays and private uses for garden sheds or children's playhouses. Feel free to contact us about any special requirements you may need.